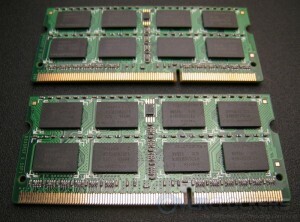 With systems getting smaller and smaller, many people are having to rely on laptop memory sticks (SO-DIMM) to fit everything on the motherboard. So, when you change over to one of these tiny systems, are you compromising your ability to tweak and tune the system for it’s top performance? Luckily, the answer is: not necessarily. With any luck, these ADATA Supreme DDR3-1333 sticks can live up to their name. Just like desktop RAM, laptop RAM is offered in a variety of speeds and CAS latencies to fit every budget. When placed in a typical laptop, heat and power draw will be major limiting factors but a Mini-ITX system can offer the options you are used to seeing with a regular ATX desktop system. So, it would seem reasonable to think that laptop RAM should be overclockable and tweakable just like it’s desktop counterparts. 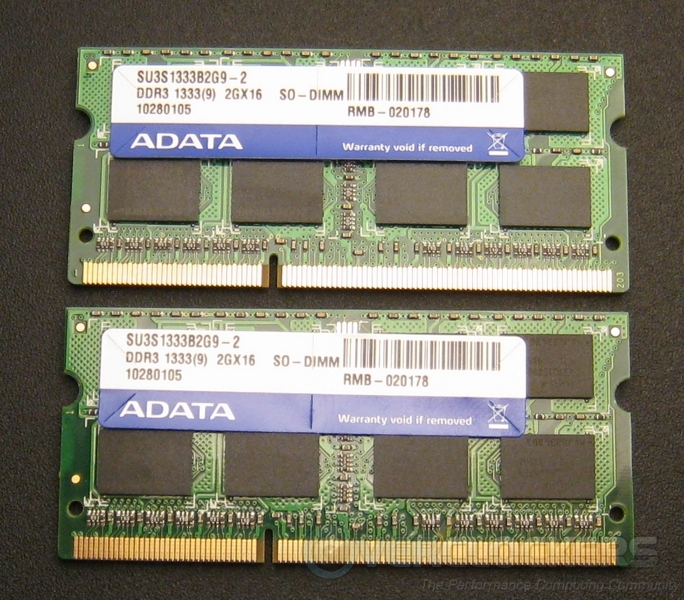 ADATA Supreme DDR3-1333 SO-DIMMs come in 1 GB, 2 GB, and 4 GB modules. I’m reviewing two 2GB modules. These don’t have any heatsinks so you’ll have to be careful with the voltage. These should run at 1.65 V, just like desktop modules, for a short period of time but I would not expect them to last if run at that setting for an extended period. The Hynix ICs are designated as H5TQ1G83BFR G7C, which should be DDR3-1066 CL7 according to their product page. If this is true, then ADATA worked some magic getting them to run stable with stock settings at DDR3-1333 CL9. 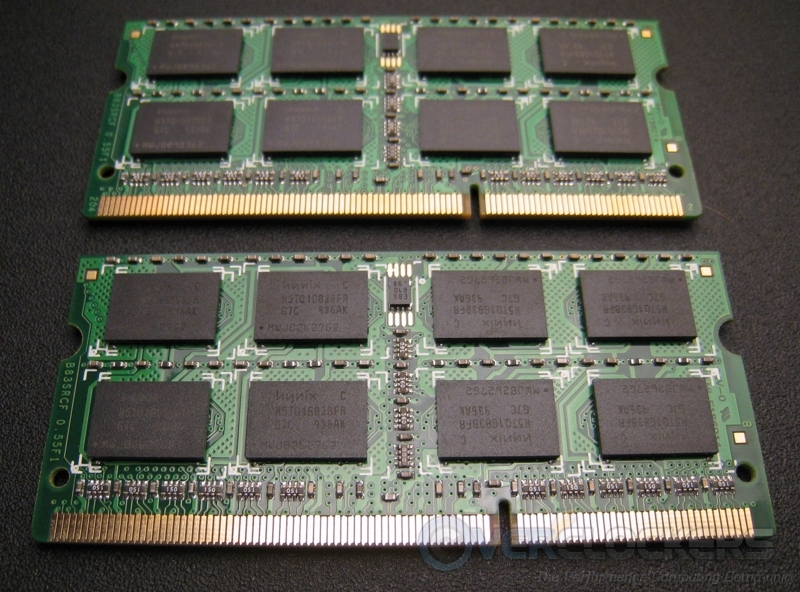 The product page also hints that these should be able to run at DDR3-1600 CL10 with a little help. Unfortunately, the Mvix Minix 890GX motherboard I used to test these would not allow for FSB (base clock) overclocking, so I was left with simply changing the clock ratios and latencies. This also led to the side effect of receiving a “DIMM CL/T mismatch. DIMM(s) Running in Minimum Mode” error whenever I tried to use a ratio higher than the rated speed (800 MHz, for instance). When I got this error, the computer would still boot fine and would pass memtest86+, but the memory bandwidth certainly took a hit. CPU-Z would also show the running speed at 800 MHz (DDR3-1600) even though the tests would come out much slower than stock speeds. With the locked base clock, I could not test to see if this error was simply caused by increasing the ratio or if running the sticks above spec in any way was forbidden. Because of these limitations, the only way I was able to test these was to tighten up the latencies and drop the frequencies to see if there was any hint of performance scaling. The ADATA sticks ran fine at DDR3-1333 CL7 settings with 1.65 V and I dropped them to DDR3-1066 to compare them to a set of Kingston sticks I had to hand. These results certainly look erratic and don’t represent what you’d expect. They suggest that in Windows there are other factors at play which decide RAM performance. I don’t have any theories as to what is going on but all of the results are within 3% of each other which doesn’t separate out a true winner in any test. Phoronix Test Suite is a collection of cross-platform tests that can be used to compare systems of any kind. They can be run as single tests or in a bulk mode. I chose to run the Memory Suite under Ubuntu 10.10 to get another perspective of how these memory sticks performed. Test Notes: Compiz was running on this system. AMD CnQ was enabled. Test Notes: Compiz was running on this system. Test Notes: Compiz was running on this system. Test Notes: Compiz was running on this system. 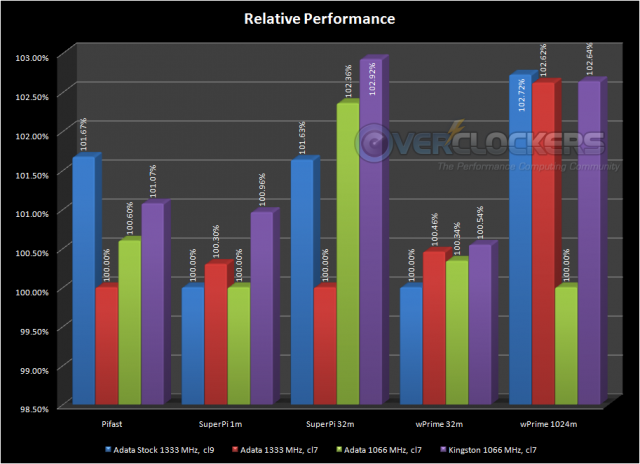 The ADATA ram set to 1333 MHz and CAS Latency 7 wins in every test except for one, which is odd. I cannot explain why the ADATA ram running 1333 MHz but CL9 wins in the CacheBench Read Cache test, or why the same speed but tighter latency is slowest overall. What is very interesting, though, is that the ADATA ram set to 1066 MHz and CL7 is faster than the Kingston ram in all tests at the same settings. 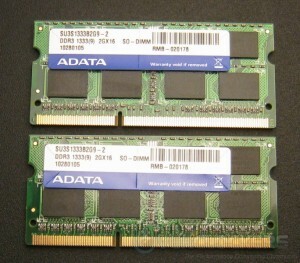 This could possibly be explained as the difference between 2×2 GB (ADATA) sticks and 2×1 GB sticks (Kingston). In reality, the CacheBench results are all within 1% of each other so it is difficult to declare a true winner. These results are on Phoronix Global, too, so you can test you own system and compare it directly to these numbers. In Linux, the memory performance is much more predictable and a little easier to declare a winner. The ADATA Supreme DDR3-1333 sticks really surprised me that they ran so smoothly at CL7. This coupled with the information from the Hynix website suggests to me that the ADATA Supremes are binned very well and are certainly worth tweaking to get the most performance out of them. What’s even more interesting is that the Supremes beat the Kingstons at DDR3-1066 in all of the RAMspeed and Stream tests in Phoronix Test Suite. 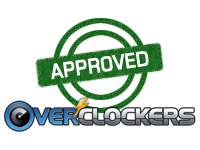 For these reasons, I am marking these Overclockers Approved and wouldn’t hesitate to recommend them if you are looking for RAM for you laptop or HTPC.